I don’t know about you, but for me, there’s nothing nicer than a knife-and-fork meal that’s easy to prepare and brings everyone together at the dinner table. I often rely on Barber Foods stuffed chicken breasts to make dinner special, pairing them with simple side dishes like these perfectly baked sweet potatoes. The side dishes I have when I dine out often inspire me to try new side dishes at home. When my dad and stepmom came to visit this winter, we ate a local restaurant that served baked sweet potatoes as a side dish. I don’t usually order a baked sweet potato as a side dish, but on a whim, I ordered one. It was ethereal. Perfectly dry, slightly crisp skin, and pure fluffiness within. A little butter, a little salt, and a dab of sour cream completed the masterwork. Later that week, I contacted the restaurant to ask for the recipe. As it turned out, they added nothing to the sweet potatoes before cooking them in a large commercial convection oven at 350 F for 40 minutes. I was stymied. Not even a home convection oven can match the effect of cooking in a commercial convection oven. And my otherwise fabulous conventional oven wouldn’t be able to hold a candle to a commercial convection oven! So, I resolved to find a workaround. To discover exactly how to make good baked sweet potatoes at home, replicating (as closely as possible) the quality of the one I had enjoyed so much. I spent more time than might be considered seemly researching baked sweet potatoes. Some were blasted at high heat, up to 450 F. while others were cooked at a comparatively low 350 F. Some cooks wrapped their sweet potatoes in foil, while others eschewed foil as a problematic coating leading to gumminess. Many cooks were vehement about poking lots of holes in the potatoes first. The only thing to do was test, test, test! I bought a bushel of sweet potatoes and got to work. 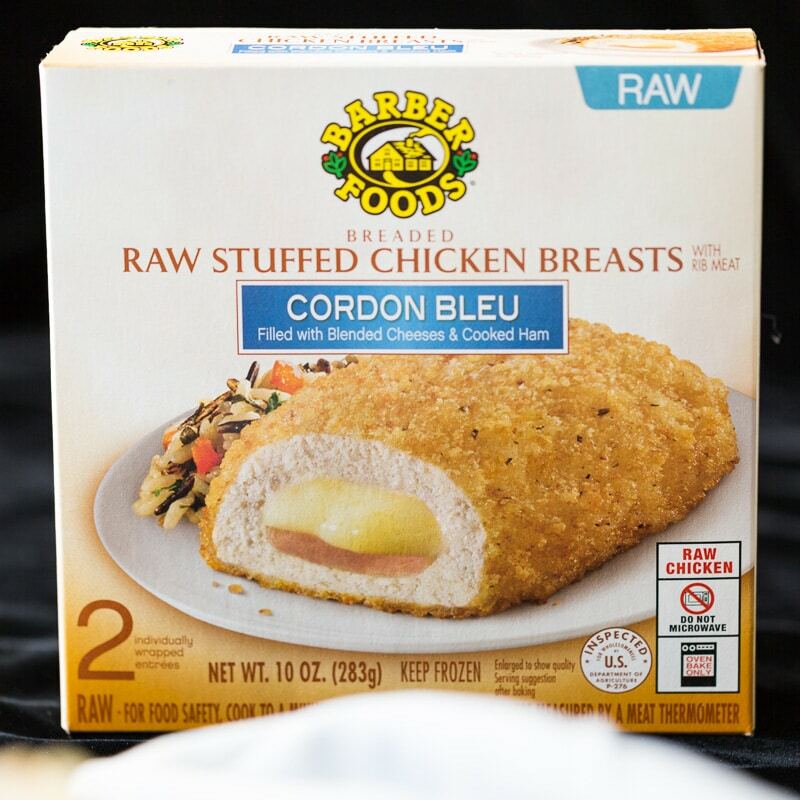 While I was at the store, I also picked up some Barber Foods Broccoli & Cheese and Cordon Bleu Stuffed Chicken Breasts. 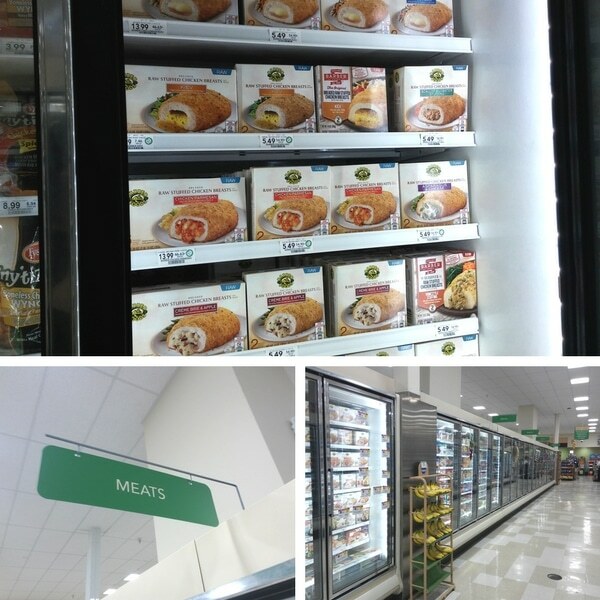 You can find them on the frozen food aisle with the frozen meats. 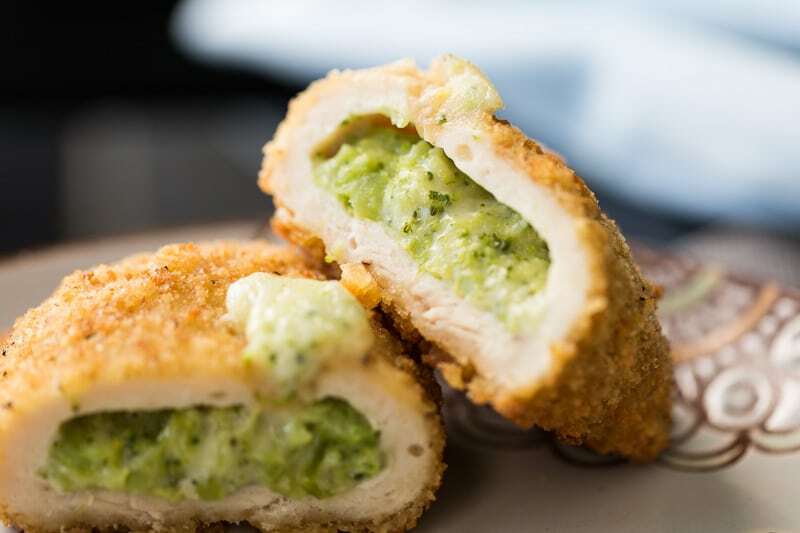 To make Barber Foods stuffed chicken breasts, simply preheat the oven to 375 F, remove the stuffed chicken breasts from the pouch, bake for 35 to 40 minutes, and cool slightly before serving. Pair with one of these baked sweet potatoes, and voila! You’ve made it a #BarberNight. Use the handy product locator to find Barber Foods products near you and get a coupon to save on your purchase. 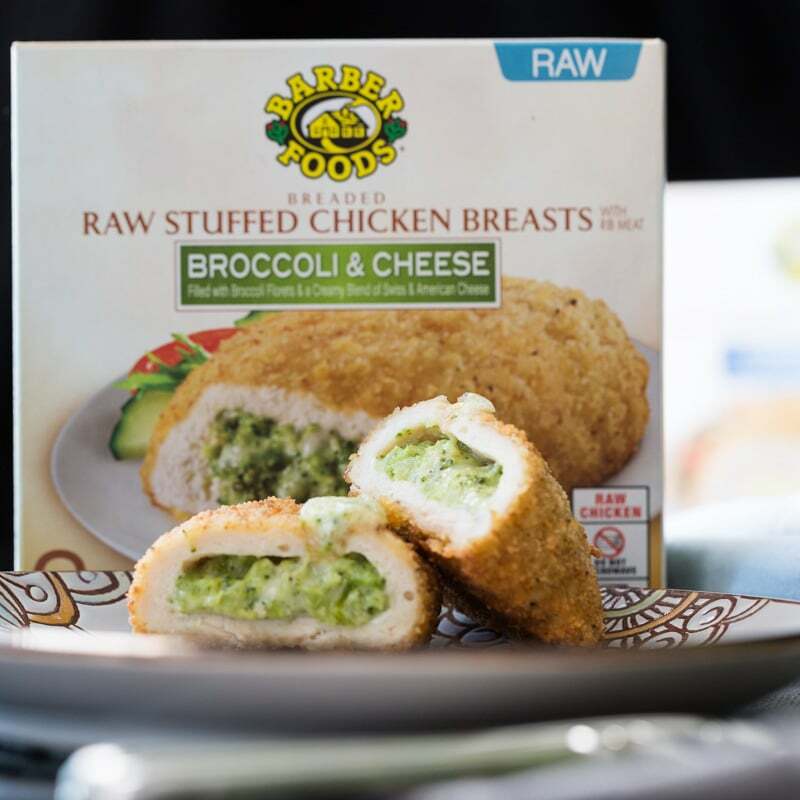 I tried both the Barber Foods Chicken Cordon Bleu and the Barber Foods Broccoli & Cheese stuffed chicken breasts. The savory meat and filling paired quite well with a baked sweet potato. Since I had baked so many sweet potatoes ahead of time, all I had to do was pop a few in the oven to reheat as the stuffed chicken finished cooking. I will also give you the secret for baking sweet potatoes at any temperature between 350 F and 450 F so that you can cook them alongside your main dish, so read on below! 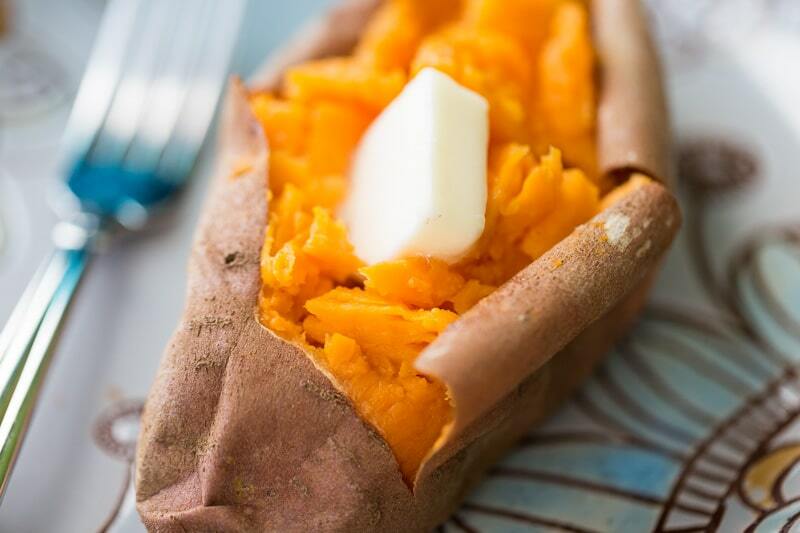 So What’s the Secret to Great Baked Sweet Potatoes? It is key to select sweet potatoes that are roughly the same size and shape so that they cook at the same rate. Otherwise, some will get done before the others. You can poke holes in them… but in my tests, it honestly didn’t seem to make a difference. Don’t wrap them in foil; it traps steam and leads to gumminess. Also, when they’re done, you must cut them open immediately after removing them from the oven—even if you’re not going to eat them right away. Be careful! They will be very hot. Cutting them open really does let the steam escape. There’s no need to bake them on a bed of salt or do anything fancy (yes, I tried it). Toss them on the oven rack, or on a pan if you’re worried about a mess. Temperature is flexible. That’s right! I successfully baked sweet potatoes at temperatures between 350 and 450 F. And they came out exactly the same. That means you can bake your sweet potatoes at the same time as your main dish, as long as you start them at the right time to finish together. The key secret is that baked sweet potatoes are done when an instant read thermometer inserted in the thickest part reads 205 to 210 F. That’s all! You can bake them at any temperature from 350 to 450 F and get the same result as long as you reach 205 F.
After that, just throw some salt and butter on there, and if you’re feeling decadent, a little sour cream. Then line it up next to your Barber Foods stuffed chicken breast and enjoy! The only recipe you'll ever need for baked sweet potatoes. Crispy on the outside, savory on the inside. Top with butter and sea salt! Preheat the oven to 400 F (see note about temperature variations). Place the sweet potatoes directly on the oven rack, or, if you prefer, on a baking sheet. Bake for about 1 hour, or until an instant read thermometer reads between 205 and 210 F. You can also tell if they are done by piercing the flesh with a fork. If it slides in very easily, they're done. If you are cooking a main dish in the oven at the same time, you can bake the sweet potatoes at any temperature between 350 and 450 F. At 350 F, they will take approximately 1 hour and 15 minutes. At 450 F, they will take approximately 45 minutes. Actual time may vary depending on how much food is being cooked in the oven. Use the doneness tests in the instructions to be sure the sweet potatoes are done. Find Barber Foods products and get a printable coupon. Baked sweet potatoes have long been a staple in my southern home. I learned to bake them by watching my mom and grandma. Looks like you found the secret. Your potato looks amazing. Makes me want to bake some tonight. I never poke holes in mine or wrap them in foil. Mmmmm! Those sound so good. I know my whole family would love them. I am going to keep an eye out for these the next time I go shopping. I loved baked sweet potatoes. They are so naturally sweet, and they’re SUPER healthy for you. Yum. I’ve been loving sweet potatoes since my husband and I started making sweet potato fries with our burgers. They are much more wholesome and tastier than regular potatoes! My family loves he potatoes! I am trying to eat healthier and sweet potatoes is on my list of foods that are healthier. I will be trying this. I’m a huge fan of sweet potato fries, but I’ve never tried baked sweet potatoes. I should try one soon – I know I’ll like it! 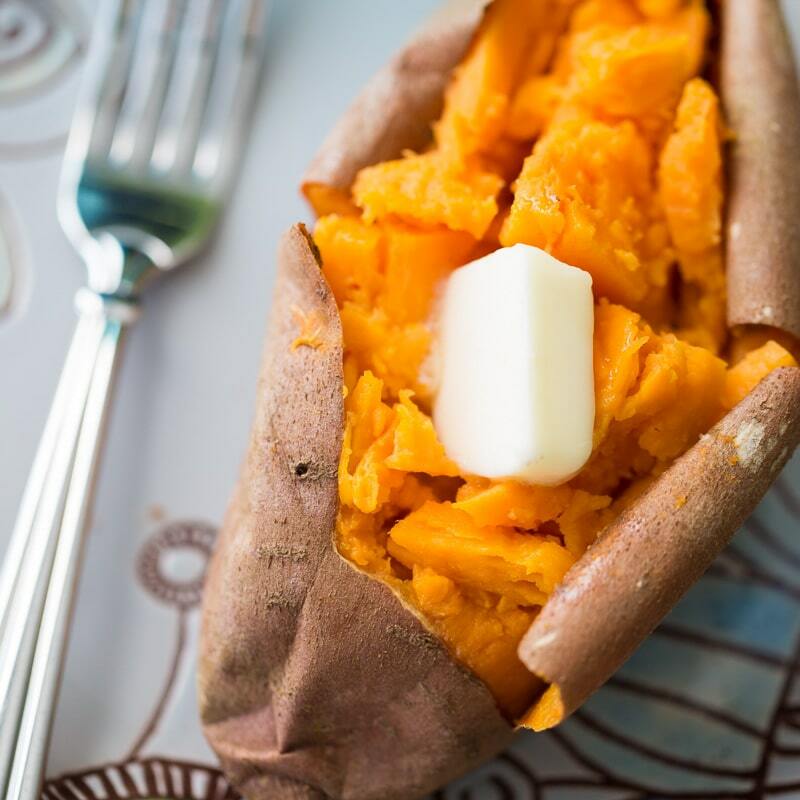 Oh my gosh, how have I NEVER tried Baked Sweet Potatoes before?! I love baked potatoes (basically potatoes in general) and sweet potatoes but I’m never thought of combing the two. I can’t wait to try this. I’ve never baked a sweet potato. I’ve had sweet potato fries, but, not the whole thing :). 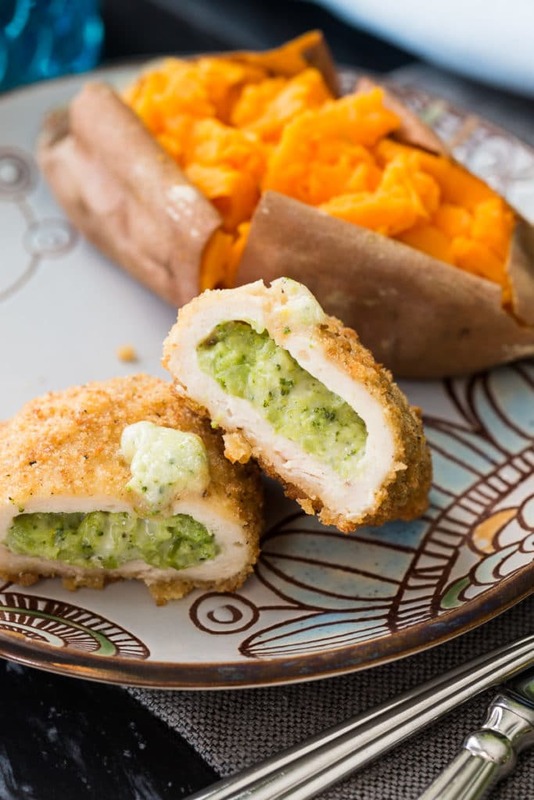 That broccoli and cheese stuffed chicken looks delish! Sweet potatoes are delish. Very tasty and easy to work with. I love you baked recipe. That is interesting to know that baked sweet potatoes turn out perfectly cooked regardless of the oven’s temperature. Thanks for the tip about using foil. I did that once and it did make the sweet potatoes gummy. I love baked sweet potatoes! Thanks for letting me know not to wrap them in foil. You don’t want them to be gummy! 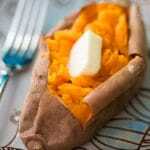 I am not a sweet potato fan but I may ave to try this recipe. Great post! Your potatoes look great! I think I first saw the Barber chicken in BJs (I think), they’re so convenient to keep in the freezer. I absolutely LOVE sweet potatoes for how yummy and versatile they are. 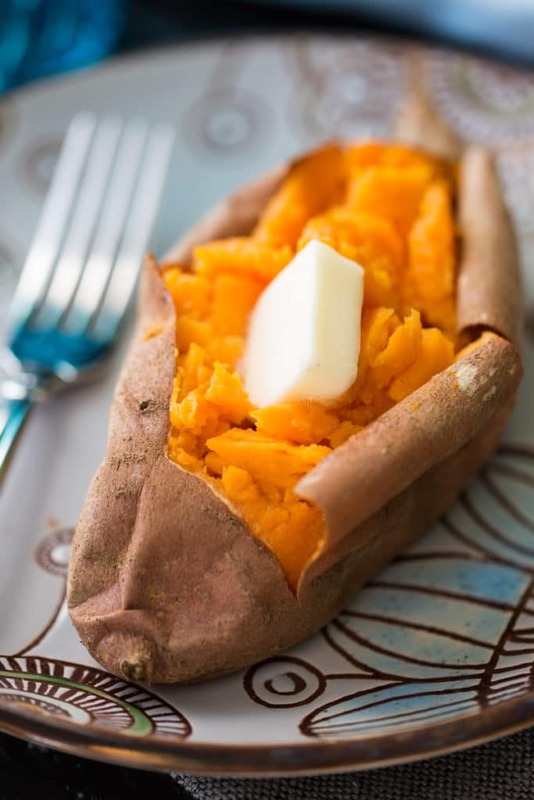 Such great tips for baking the perfect sweet potato and how to make the best weeknight meal EVER. Thank you for this awesome recipe. I have three medium size sweet potato here so this would be perfect to make today. I need to check out Barbers Food so I can experiment too along with sweet potatoes. Looks like a good combination. I’ll try this soon! Growing up we ate Chicken Cordon Bleu all the time. They were our go-to snack when we got home from school. I loved a good baked potato but I’ve not perfected a sweet potato. I’m going to try this.